Competition is fierce among car dealerships – and it has only gotten more intense as Internet advertising has moved to the forefront in the marketing arena. Modern Automotive, with dealerships across North Carolina, can testify to the challenges associated with meeting manufacturer sales goals in a highly-competitive environment. The company can also testify that meeting – and exceeding – those sales goals can be done. Jamie found LotLinx and signed up. The results have given Modern Automotive the edge it needs: in November 2015, the dealership saw a 103% sales velocity increase with 438 vehicles sold at a rate of $11.07 per sale. The increased sales velocity also translated to $36,324 saved on inventory holding costs for that month. 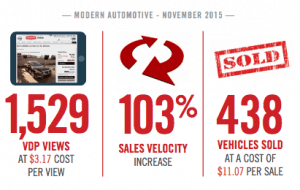 Read the full story of Modern Automotive’s success over the competition here.